Right now I'm working on a knitted scarf for my husband. He wears scarves throughout the winter then they get misplaced in the summer. I had to take a short break and hooked up a bunch of these little charms last night. Rnd 2: ch 1 (does not count as first stitch), sc 3 times in "ear", ch 3, sl st in first ch (picot made), sc 3 times in ear, sc 16 times in big loop, sc 3 times in "ear", ch 3, sl st in first ch (picot made), sc 3 times in ear, 2 sc in top of "head". Sl st to join. If you want to add a loop, sl st back one stitch, chain 5, sl st in next sc in top of the head. 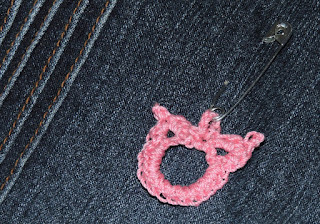 If you're going to put it on a safety pin like I did, you might want to break off the yarn to pull the chain through the bottom loop before the final slip stitch. Weave in ends. Block and stiffen if desired. They are so quick. I'm going to try one later with beaded single crochets!